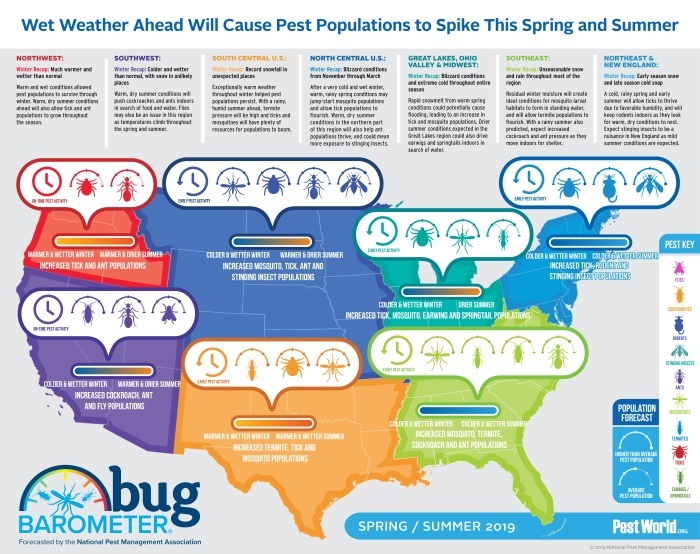 by Brianna Crandall — April 3, 2019 — The nonprofit National Pest Management Association (NPMA) recently released its bi-annual Bug Barometer, a seasonal forecast of the pest pressure and activity Americans can expect to see in their respective regions of the country based on weather patterns and long-term predictions, as well as pest biological behaviors. According to the group’s team of entomologists, residual winter moisture coupled with wet forecasts ahead will cause pest populations to spike early in much of the continental US this spring and summer. The bi-annual Bug Barometer forecasts pest activity that US regions can expect to see based on weather patterns, long-term predictions, and pest biological behaviors. Graphic courtesy NPMA. Click to enlarge. While regions across the country were either unseasonably cold or warm this past winter, there’s one factor that almost all of them had in common — excessive moisture. From record-setting snow in parts of Texas and Arizona to excessive rain in the southeast, continued precipitation predicted for most of the country this upcoming season will allow pest populations to continue to thrive and multiply. Cockroach, ant and fly populations in drier regions will push their way indoors in search of food and water, bringing about a whole host of indoor pest-related health issues including food contamination. Cockroaches can also trigger asthma and allergy symptoms. Exceptionally warm weather throughout winter helped pest populations persist. With a rainy, humid summer ahead, termite pressure will be high, and ticks and mosquitoes will have plenty of resources for populations to boom. For more information on NPMA’s Bug Barometer, to find a pest control company, or to learn more about commercial services available to protect against common pests, visit the PestWorld.org website.